In a battle of wits between Discworld’s Greatest Conman/Civil Servant and Discworld’s Premier Newspaper Editor, who would win? As a journalist I’m inclined to think William would pull through in the end, but Moist is a slippery one, no pun intended. For a while now I’ve been seeing the parallels between Terry Pratchett’s two young protagonists. Maybe around 28-years-old, the two are both part of trades where the truth can sometimes feel transient in the face of danger. Moist and William are two of a kind and neither are happy unless they are under control of the playing field. So how would a battle of wits between these two go down? We see a small preview of this in Going Postal and Making Money when Sacharissa Cripslock confronted Moist about his civil antics, so I think that’s how it would begin. After the interview Sacahrissa would report back to the Times. 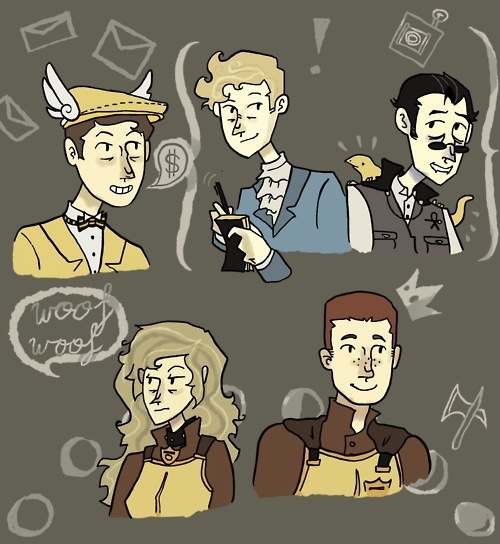 Unlike Vetinari and unlike most of the guild leaders, Moist is an enigma wrapped in golden frustration. William would slam his hand down onto the desk dislodging a stack of papers and a wood worm in the process. “What the -ing was that?” If we knew why the woodworm said this then we might know a bit more about the nature Discworld Universe than we do now. William storms out of the office with his notepad in hand taking care to avoid the Watch on his way to the Royal Mint. Barging past the guards and into the office he narrowly avoids the two bolts that zips past his head. William jots this down in his pad. It’s a tense conversation with questions thrown and a few clever ripostes from Moist accenting the interview. Finally William gets his quote and feeling victorious he leaves the office. On his way out of the door woman in a grey dresses stubs a cigarette on his notepad. William flinches a bit. Moist reloads the crossbows and takes out his earwigs. He sits down at the desk and picks up the copy of the Times from his desk to do the daily crossword. On his way down the steps , William takes a look at his notepad. What the hell are these notes? They’re all about ear hair… Luckily he brought his recorder. The imp never fails to take down every word. He sits down on the steps to take a listen. The Chairman saddles up beside William. The Times reporter in him wonders if getting a quote would help the story. He decides against it trying desperately to get rid of the image of whatever the dog was chewing on the steps. As the evening edition of the Times is about to make its rounds, Moist Von Lipwig boards a coach. There’s no way he’d go out in his golden suit that’d be a bad, bad move. No, he’s going incognito to scope the scene and put out a little misinformation and misdirection. Otto is down in the crowd taking some photos of the scene. William motions to him from the window. He takes a photo of one man handing out the papers. Later that evening, William takes a glance at the day’s prints. Someone in them catches his eye. His face is… vaguely familiar. He compares them to some photos taken of Moist a day earlier. The next morning the Times lands on Moist’s desk with the headline, “Royal Mint Chairman in Disguise, Fake Earwig and Policies.” Oh boy, that’s going to get him a talking to later on. 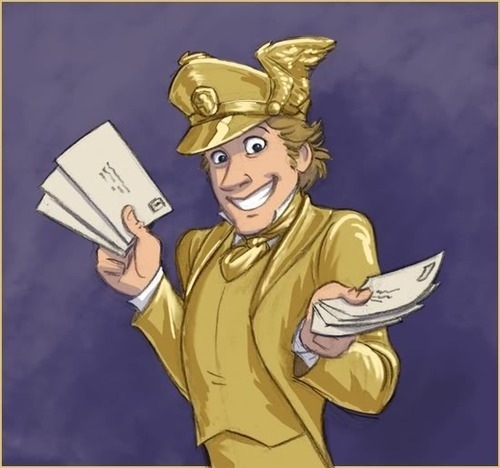 Golden Suit on, he walks out of the Royal Mint and a few minutes later slams open the door at the Times. After a heated argument inside of Williams’s office, someone was punched and someone was kicked. Rolling on the floor of the office the two hurl insults at one another , one point out spelling errors and the other tips on how to look less tacky. Sacharissa and Adora Belle Dearhart exchange weary glances across the room, but suddenly the door opens again. Looking Lord Vetinari in the face, both William and Moist settle down. Vetinari takes them into the offices and sits them down. After a few minutes, William and Moist walk out of the room. They exchange angry glances yet relieved glances that their necks are still intact. No one seems to have won this round except Vetinari, but that always seems to be the way in Ankh Morpork. Equal in wit, wisdom, and cunning, a conflict between William de Worde and Moist von Lipwig would almost always end in a tie between the two of them. What I know for sure is that between the two of them if it came to blows, Moist would likely win out in the end… because of Vetinari. It’s unclear what exactly the Patrician of Ankh Morpork has planned for the conman, but we all know between the two of them William is definitely the more disposable. As a tyrant the fourth estate – the press – is pretty much a giant thorn in his side. 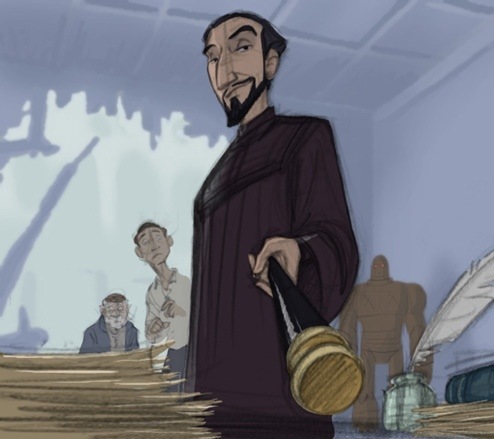 Moist is a far more valuable personality for Vetinari, but the truth will out. This entry was posted in Science Fiction & Fantasy and tagged Discworld, Going Postal, Making Money, Terry Pratchett, The Truth. Bookmark the permalink.